Join us on November 8 to hear Dr. Tianshu Sun (University of Southern California Marshall School of Business). Tianshu Sun’s research conducted in collaboration with leading private and public sector platforms addresses how firms can use business analytics and large-scale field experiments in conjunction with big data to improve business decisions. 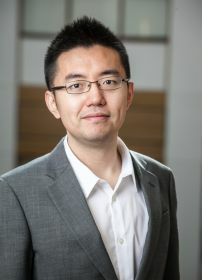 His current research focuses on understanding 1) how digital platforms can use IT-enabled and analytics-driven interventions to influence information sharing among individuals, and 2) how organizations can leverage mobile devices and Internet of Things to influence individuals’ offline behaviors. Tianshu has worked closely with a variety of organizations in US and China including Facebook, Alibaba, NetEase, LivingSocial, Adobe, Collage and Ministry of Health. Many findings from these studies have been implemented by collaborating organizations. Tianshu has given over 70 talks at top universities (e.g. MIT, Wharton, Stanford, CMU) and international conferences, and has research papers published in top journals including Management Science, Information Systems Research and Journal of Health Economics. Tianshu’s research has received nine Best Paper Awards, and has been supported by grants from the Adobe, Soros Foundation and Marketing Science Institute. Tianshu has developed and taught the first Big Data Analytics course at USC Marshall School of Business. Friendship formation is of central importance to online social network platforms and to society. In this study, we investigate whether and how displaying things in common (TIC) between users (mutual city, work, hometown, education and likes) may encourage friendship formation. Displaying TIC online may update an individual’s belief about the shared similarity with another and reduce information friction that may be hard to overcome in offline communication. We design and implement a randomized field experiment, which randomly increases the prominence of ‘things in common’ information when a user is browsing a non-friend’s profile. Leveraging exogenous variations across a viewer-profile pairs, we find that displaying TIC may significantly increase the probability of friendship formation, and especially effective for people who have little in common. Such findings suggest that displaying things in common could be effective in connecting people with different backgrounds, potentially increasing the diversity of a user’s articulated friendships in the social network. We explore the heterogeneity in the treatment effect and demonstrate that displaying TIC is effective in helping a wide range of users with different demographics and friendship status. In summary, our study offers actionable insights to social network sites and policy makers for facilitating users’ friending decisions and cultivating weak ties in social networks. The study also contributes to the network theory by providing the first experimental evidence for the role of preference over things in common (versus structural factors) in driving network formation.